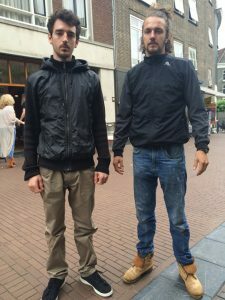 ‘Impersonate Police’ by Simon Farid, performed by Eliot en Jelle. Click here for the original text on the Strange Messenger blog by Edwin Stolk. The title Unnoticed Art Festival raises questions for me and that’s good I think. Art is already too often marginalized and should be very present in my opinion. The second edition of the festival was marked in my agenda on 24, 25 and June 26, 2016. 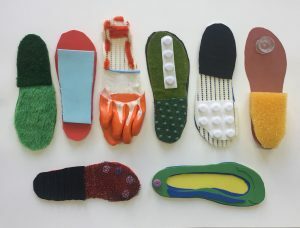 Until then artists had the possibility to send in their concept proposals and finally it was up to a group of volunteers to perform a selection. Friday evening we gathered at the train station in Utrecht, the final destination was unknown for all of us. The exact meeting location; Burger King next to platform 14/15. The place where people rush to buy some junk food while they have just enough time to switch their trains. Thursday initiator Frans van Lent corrected our ‘image’ of this meeting place with an e-mail: “Burger King has been replaced by a Hema.” Nothing is fixed these days, the usual business at top locations. The online dictionary tells me that the meaning of Unnoticed is “not perceived or observed”, but is it actually possible to be unnoticed? The artist Heinrich Obst decided to find out for himself with his contribution: do not meet me. there a work in which he took the concept of the festival literally and decided to disappear himself. While he was reported missing by the group of performers he noted later that his attempt to disappear had failed when he received the bill on his hideout. This example seems simple but to mention it here for me is essential. I think out of context seems to me much better instead of unnoticed and this can be an important vehicle for social reflection. The feeling of being ‘unnoticed’ often appears after stepping out of a certain order and by doing so one becomes less noticed. I experienced as a participant that it felt sometimes as if to be part of a secret community (disconnected) and therefore the experience of the performance stayed more introvert between the group who knew and the performer itself. The festival is a beautiful initiative where people enjoy playing with each other and experience what it feels like to play together in an unfamiliar city. The white walls are missing here but still you do not feel a connected public space as if society lacks the ability for contact. My love for this festival appears most of all in all these aspects in which it differs from the usual festivals. Maybe it is even better not to call this a festival. Because it is not operating in favor of local politicians and serving a city branding agenda and it is not part of the established art scene. It is as free as it can be in our repressive economic environment. This is both its strength but also its weakness. From this marginal unannounced position important opportunities arise and if I am sincere I do wonder whether all these opportunities were actually fully exploited. Therefore, I would like to attempt to articulate the pitfalls of this alleged invisibility. It is in my view a missed opportunity when an artist places a representation of his image made of cardboard at the opening party. I also do find it inappropriate to serve crazy concepts with the knowledge that you yourself are not the one who has to actually perform it in the city. Invisibility is a dangerous and serious game because you never play alone. An appropriate responsibility is therefore necessary. It is tempting to imagine yourself autonomous but before you know it you import the introverted bubble of the white cube within the city. We sometimes seem to forget that we are part of an invisible and complex power structure that has already observed us long ago. The rich palette of interconnections to which we are exposed as we move is far from neutral. It is a naive thought to place unnoticed art here in a central position. I think it is much more important to construct hybrid imaging applications that are able to fully seduce a certain spot to open itself. The importance and the complexity to do so became clear with Denial-of-Service. 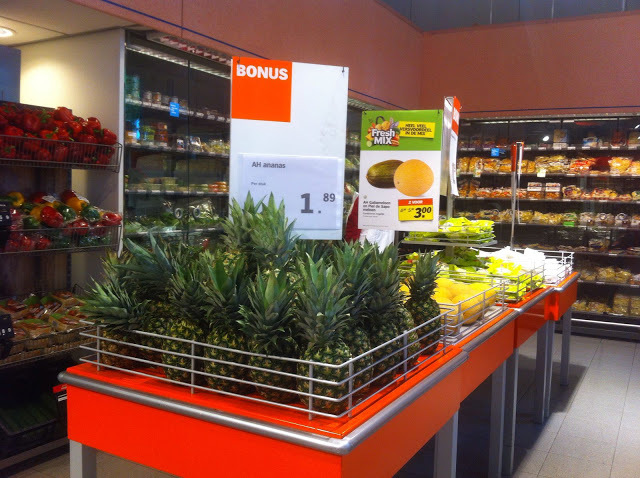 We advised clients on the available deals in an Albert Heijn supermarket and asked people to join a collective action where we tried to empty a table with discounted pineapples. We intended to investigate the influence that customers can have on the shop offerings. Many people looked away or were in a hurry. We were unable to get enough attention to explain that this was a collective action with a shared goal and not about the individual question whether or not you yourself were a fan of pineapples. While we were supportive to the shop owners advising their clients on the best available deals both Jumbo and the AH liked to stop our intentions. Twice we got a lesson in economics. Together as performers we agreed that if we wanted to continue, our strategy had to be adjusted. 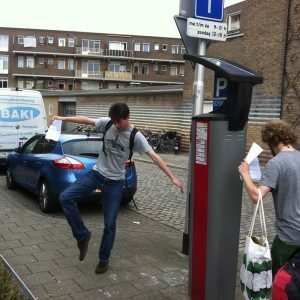 Read here the report about the Unnoticed Art Festival on the Gruzemayerblog. The work ‘Hidden Sculptures’, by Josh Schwebel. More information wil follow soon!